You are a psychic, a healer, a visionary and Mystic. These powers, these abilities are manifestations of the greater power within you and the greater connection you share with the Divine power that enfolds us all. Within you is the power to heal, the power to see, and hear, and know – the Divine Spark within you, and within all of us imbues you with unlimited potential, all you have to do is recognize it. This is not a psychic development class. You are already psychic. This is not a healing workshop. You are a healer, you can be healed. I am not here to teach you. I am here to help you explore who and what you are. We limit ourselves with words, styles and structures that make us smaller than what we are, you do not need to me limited. Your abilities are innate to your Soul and your Soul is limitless. You are so much more, so much greater, and so much more connected than you know. We will explore that connection, together. You've studied metaphysics, psychic development, or Reiki. You know you have psychic abilities and have felt energies flow through your body. Maybe you've spent a lifetime studying metaphysics and spirituality or you are just beginning to explore the mysteries of the universe. How does it fit together? How can you integrate what you have learned, see the connectedness of all things bringing that knowledge and ability to bear? • See, hear, feel, taste and experience the energies that surround you. • Follow the flow of energy in living things, finding blockages and imbalances. • Be aware of the unseen beings, spirits and critters around you at all times. • Explore methods of energy clearing, shielding and psychic protection. • Understand the Chakra System and how it affects your physical and mental health. We will use meditation, imagery, art, yoga, and movement to explore this unseen world. All levels of experience and physical fitness are welcome! Students will receive workbooks and reading suggestions as well as a certificate of completion. An Introduction to Ritual - Looks at the theory and practice of Ritual. Learn the common threads that connect all sacred rituals and how to incorporate them into your own spiritual practice. I’m really excited about this class, I’ve been working on it for a while, but this is the first time I’ll be teaching it. I find ritual fascinating. Humans seem to be built for ritual, and rituals are practiced in every culture. This class is a brief introduction to ritual looking at common threads between cultures, common elements and a basic understanding of how and why rituals work. Most of my evening workshops are pretty light and fun with a greater focus on the experiential than just filling your heads with facts and lecture, but ritual is such a rich topic that I find myself drawn to a more academic exploration of the topic than I usually go for. I’m excited and a bit scared about tackling such a big topic in such a short time, but it’s going to be a great class. Wear comfortable clothes, natural fibers are best, and be ready for invocations, sacred circles, holy water and rhythmic muttering. Psychic 2 will focus on using and understanding the tools learned in Your Spiritual Toolkit. This class is only open to graduates. We will be exploring ways to take what you know, from both my class and your other studies and experiences, and use it in everyday life. We will focus on finding lost objects and people, dowsing, communicating with nature spirits and fairies, and improvising. While there will be some lecture, it will mostly revolve around group discussion and problem solving. Wear comfortable clothing as we will be playing outside and tromping through the woods exploring elemental and fairy energy. This Intensive is about 18-20 hours total and can be arranged in several ways, including 2 weekends, once a week for 7 weeks or one marathon long weekend. Psychic 1 and 2 can be combined for a week long retreat. Class size is limited – 6 Student Min, 14 Student Max, all students must be pre-registered. Learn to be a psychic reader for yourself and others. In this class you will learn how to communicate with your spirit guides, receive messages and connect with your intuition. We will use meditation, yoga, and John’s “Seven Steps to Center” to explore divination, clairvoyance and your innate psychic abilities. In this class you will learn how to give psychic readings, connect with your guides, see auras and lots more! This is an intense class and there will be homework. Wear comfortable clothes as we will be doing some light stretching and yoga to increase the flow of pranic energy through the body and aid focus and concentration. This class does not use cards, crystal balls or other tools. The magic is in you, not the wand or pendulum. Once you have learned how to access your own power all the tools and toys can be helpful and fun, but unnecessary. It’s all about learning to access your psychic abilities and unleash your mystical, magical mojo. 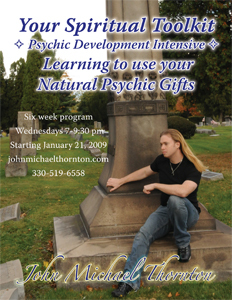 All Students will receive a psychic reading from John Thornton (included in registration price) before class begins. Students also receive study materials including, a workbook, access to the Student Forum at johnmichaelthornton.com, and a copy of my new guided meditation, “Walking the Spiral Stair” to help you continue your studies outside of class. Graduates will receive a graduation certificate and will also be eligible for John’s further education and graduate classes and workshops.